A pair of reports on Tuesday allege to show an "engineering samples" of Apple's rumored next-generation iPhone and smaller 7-inch iPad, the latter being one of the first mock-ups to hit the web. 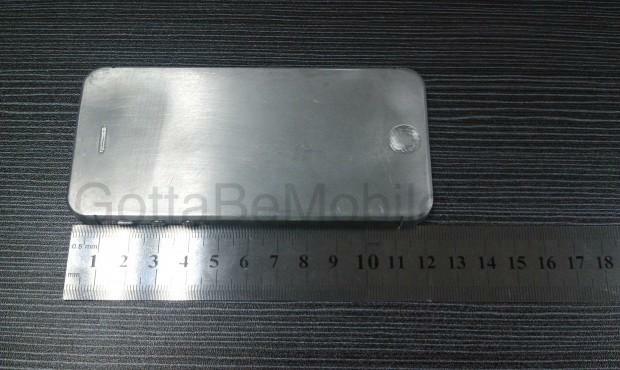 In two back-to-back reports, website Gotta Be Mobile claims to have procured what it calls engineering samples of Apple's upcoming iPhone and iPad mini from a "trusted" supply chain source, though the models bear a striking resemblance to molds used by case manufacturers for prototyping. It should be noted that because the shots have not been verified and the site's provenance is unknown, the photos are presented here for discussion purposes only as AppleInsider cannot vouch for their validity. While the models below are plausible designs they could merely be mockups or prototypes not meant for market. 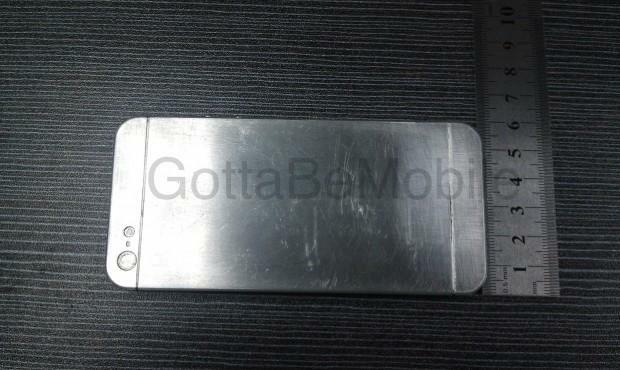 This was shown to be the case in a report from 2011 which revealed the gamble case makers took, and lost, in manufacturing so-called "teardrop design" products based on purportedly leaked 3D models of what would become the iPhone 4S. While the next-generation iPhone engineering model seems to be in line with the spate of recent parts leaks (1, 2, 3) as well as a complete rendering and comparison video. The device looks to sport the rumored 4-inch screen, rear camera layout and "uni-body" chassis and not much new information can be gleaned from the sample. 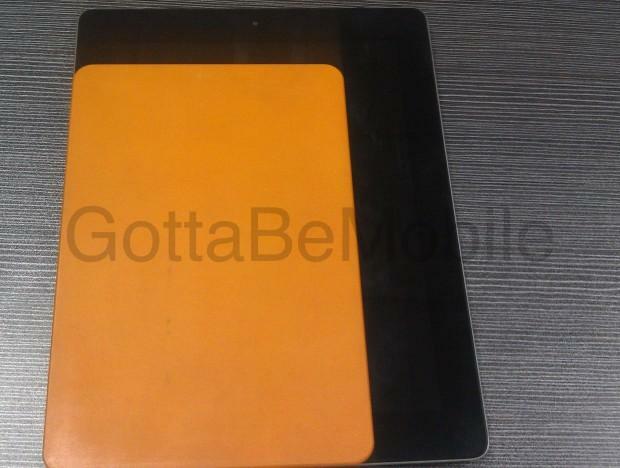 The alleged iPad mini sample photos, on the other hand, are of particular interest as the orange model is one of the first known physical representations of what the device may look like at launch. If the sample is correct, it seems that Apple will be extending the use of a new, smaller dock connector to the 7-inch iPad that has been widely rumored to be making its debut on the sixth-generation iPhone. Another change from the current iPad is speaker placement which has apparently been moved toward the center of the device to possibly avoid coverage when holding the unit in landscape mode. Screen size comparison of purported iPad mini with third-generation iPad. The plastic "early design sample" bears a striking resemblance to the current full-size iPad and goes against recent reports that the device would take its design cues from Apple's current iPod lineup. Apple manufacturing partner Foxconn is also rumored to be prepping its Brazil factory to build the smaller iPad with production said to start in September. Bottom of sample looks to hold a smaller, 19-pin dock connector. 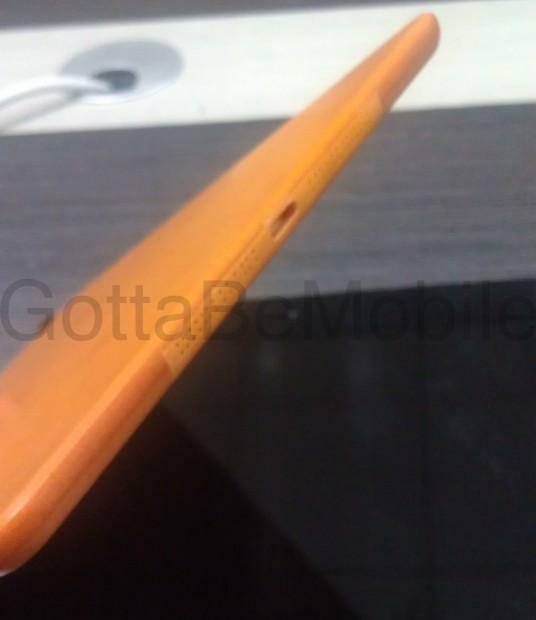 While the face of the alleged iPad mini sample is as expected, a side shot of the model's thickness reveals that the production unit could be significantly thinner than the third-generation iPad. A cleaner view of the speaker and dock orientation can also be seen below. Side-by-side comparison of unit thickness. Apple is expected to announce a follow-up to the Siri-toting iPhone 4S as early as September and rumors point to an iPad mini launch sometime before the holiday season.